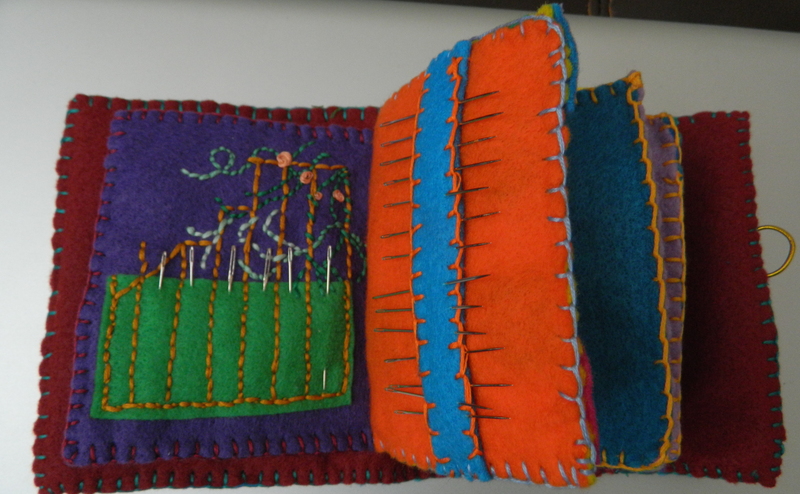 Things have been a little hectic in my life, so I thought it was a good time for a little downtime from the furniture projects and do some hand sewing. 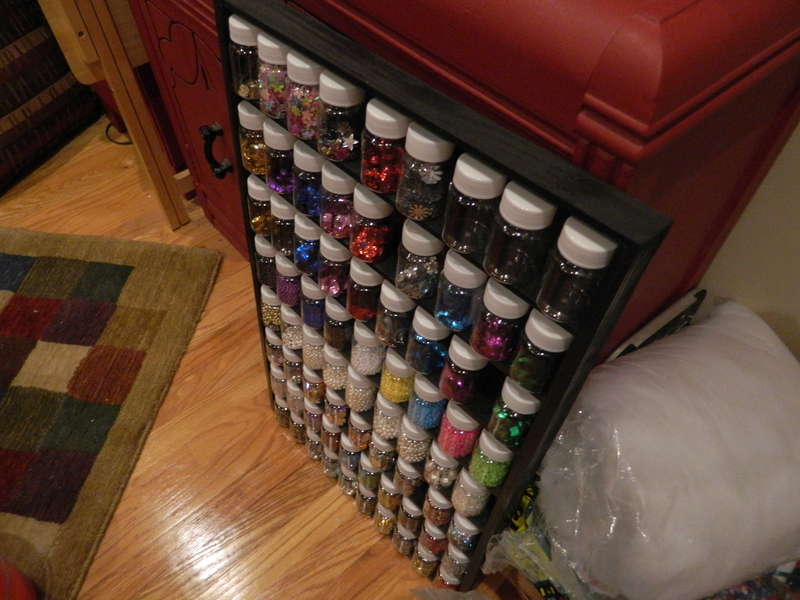 In getting all of the bits and baubles that I have finally gotten around to organizing, which gave me a central collection for all my hand sewing needles. So, then I needed to figure out a way to store them properly. It was then I stumbled onto something that apparently has been around a long time, which I’ve never heard of. Which is all I needed to jump into it with great enthusiasm. What I am a speaking of? 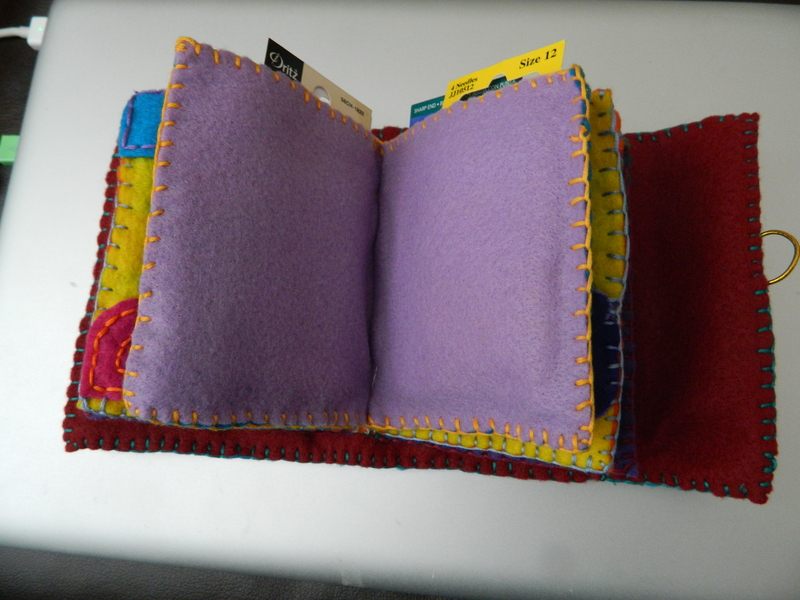 A simple little thing called a needle book. Did a little search on Google and then again on Pinterest, and came up with some great ideas. So, I settled down with some great movies and felt and thread and set about making my own. 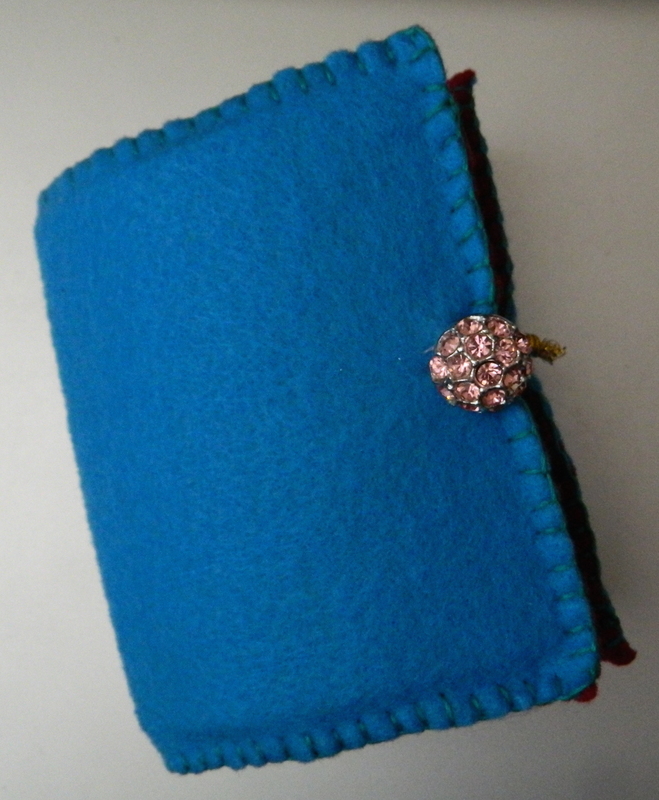 I had a different cover created, one that I had started embroidering, but when it came time to put the cover on, I found that I had seriously underestimated the book’s thickness! 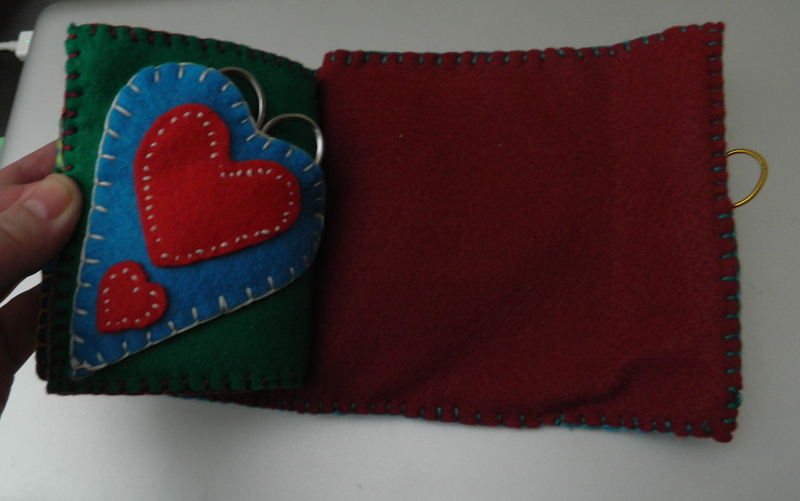 So, instead of using it, I had to make a new cover and it was left unadorned. I really had wanted to make sure that it was going to work out, rather than spending a lot of time and effort on it and not being able to use it again. And in the end, it worked out good enough. My initial thoughts is that it would be a small book. 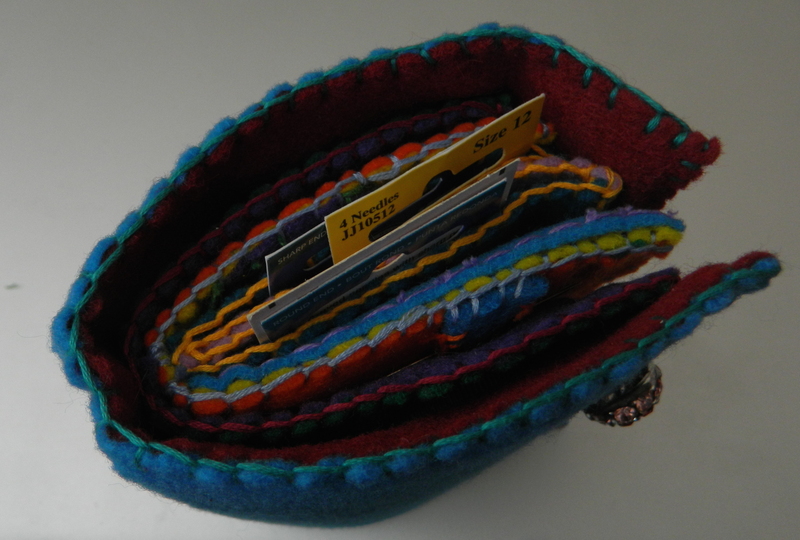 But as I worked on it, I added a pocket for a pair of small scissors, and another pocket for a small round container of needles. 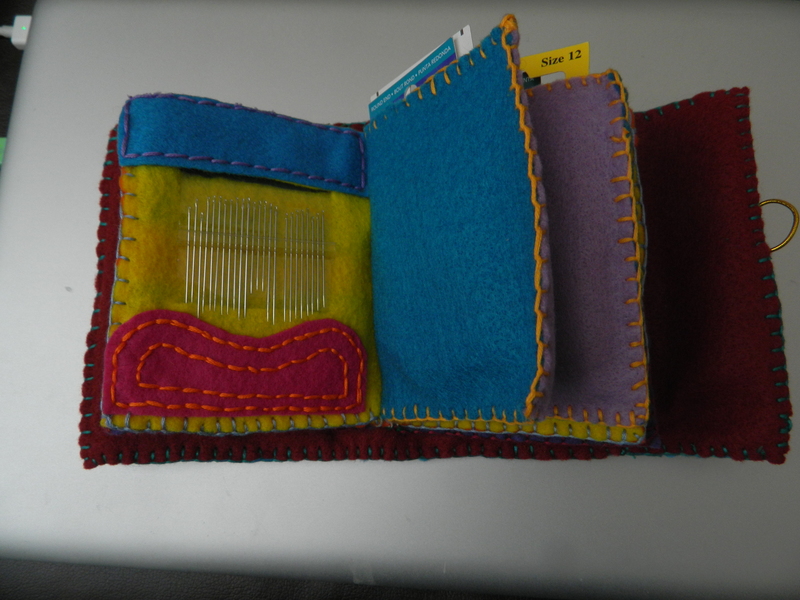 I began adding pages for the different types of needles that I have: crewel, upholstery, darning, sewing, embroidery… who knew there were so many different types? Or that I had so many of them! 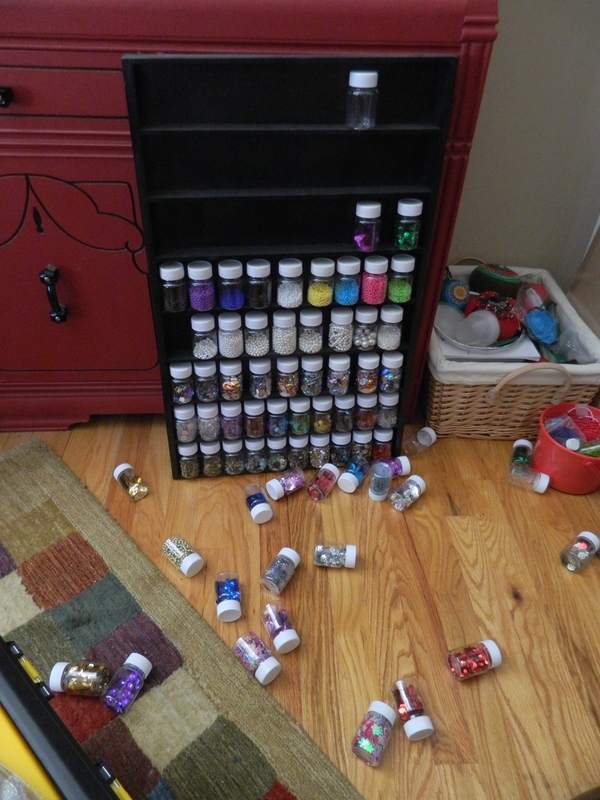 This was just the small collection that I had downstairs with my crafting supplies. I might be afraid if I gathered together in a single spot all the needles that I have in my sewing room! So, several pages completed, I realized that I had four packages of unopened needles and it might make more sense to leave them in the package. So the inside pages were really pockets, opened to the top. I attached the jacket and it looked great. 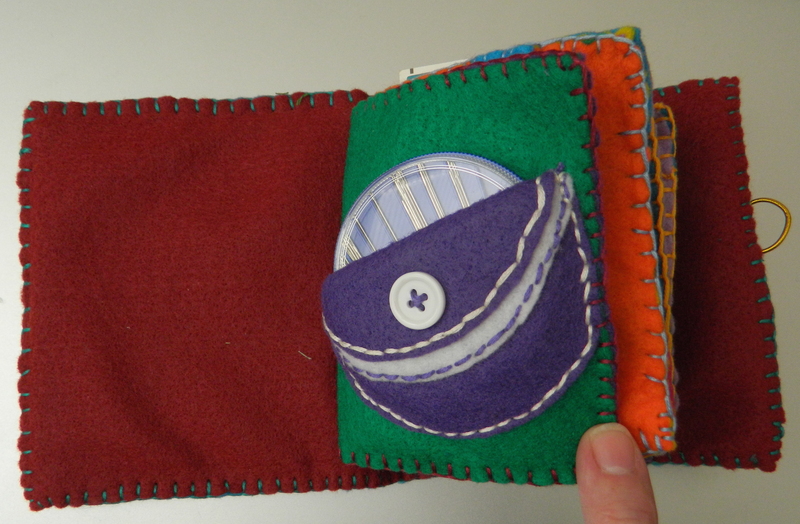 The closure was a simple button on the front with an elastic band to close it. The real problem happened when I put all the needles ‘away’. 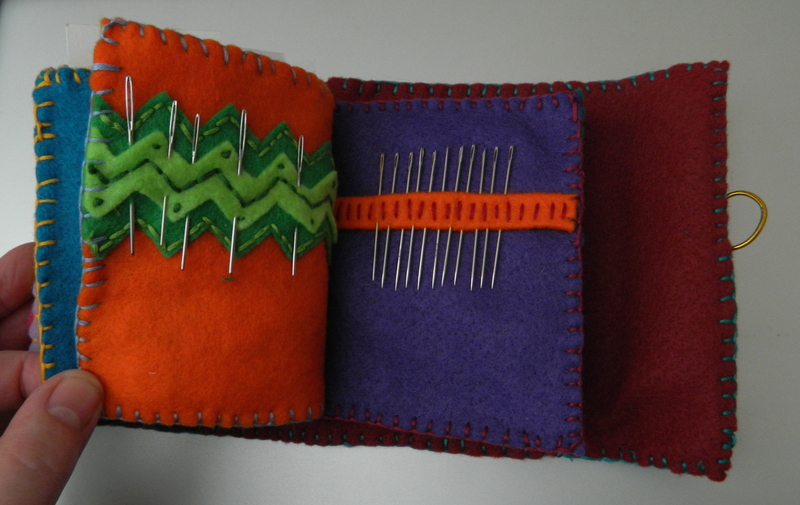 Now it appears that the book is too small for all of the needles and especially too small for the cover. It was fun creating it, and I learned a lot of lessons doing it, so now I will start working on another, correctly sized this time. And I will be going all out on the decorating this time; cover, pages, everything. But, I’ll share the photos of this one. I like it for my first attempt. 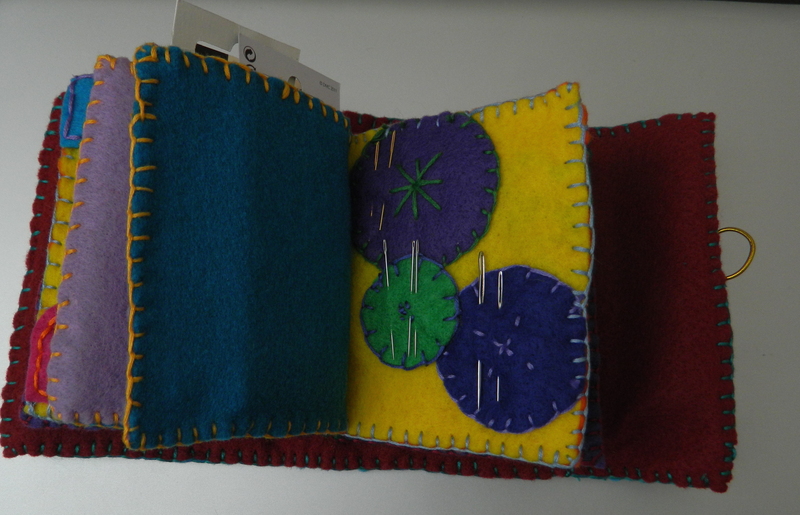 If you have suggestions or comments or photos of your needle books, I’d love to hear from you! Finally! Beautiful weather again. It has been either raining or seriously windy (or both) for the last couple of days. Not exactly the best weather to be spray painting! today, that changes. I am so ready to complete this big dining table and chairs project. I also have someone coming today (cross your fingers) to purchase the oh so girly pink on pink vanity! One thing I did manage to complete (at last!) is this challenge of building something useful using paint stir sticks. I am going to be putting together a post soon on all the amazing things that can be done with those little sticks – in addition, of course, to stirring paint! Look for it soon. But here is today’s project. Actually it was completed last night, but it was late and I was tired, so it is being posted this morning. The thing could have been done ages ago, but I had to wait for the final piece to arrive from eBay. It is both a great and a aggravating thing, buying things from eBay that are coming from China. Great, great, GREAT prices, but you have to be prepared to wait for them to ship from the other side of the world and deal with everything involved including customs on both sides. But the bottles arrived yesterday and I spent a full day organizing supplies. Woot! If you follow my blog, you know that I have been experimenting with beading and sequins and it has been oh so much fun. 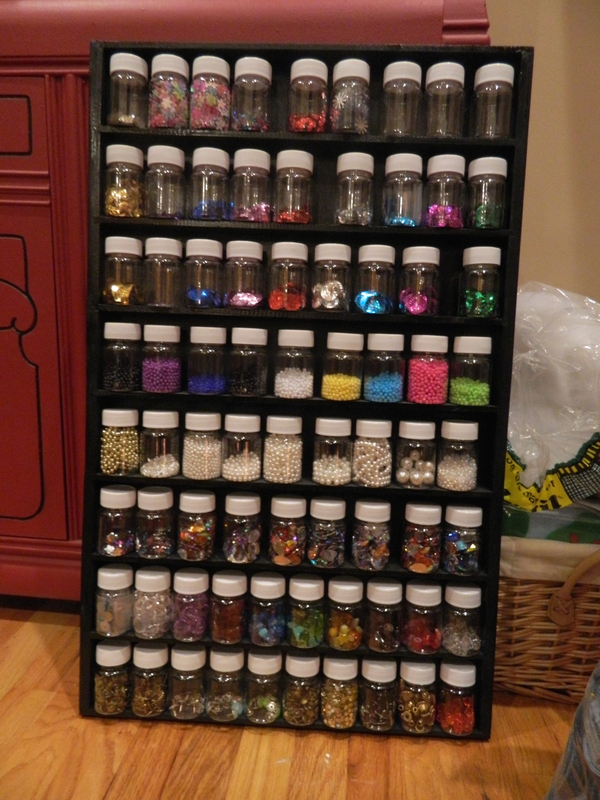 And of course, I have to go overboard on everything, nothing in moderation, so I soon realized I would need a better way to organize and store all my little pretties! I had a few of the plastic bottles, they’re plastic and 60ml and purchased from eBay. I used some for a different project and had some leftover, so using the bottle as a guide, I laid out the grid using paint stir sticks. These are the larger size and even at that, I had to join them to get the length I wanted. I started the whole thing simply by rummaging through my leftover 1/8″ plywood for a size that might work, and this is what I found. It turned out to be long enough for 9 bottles wide and 8 rows. I only had about 30 bottles, so I found the seller online and ordered the additional bottles I needed. It was a simple project, since the bottles are so light – even with their contents – it didn’t require any massive work or planning. 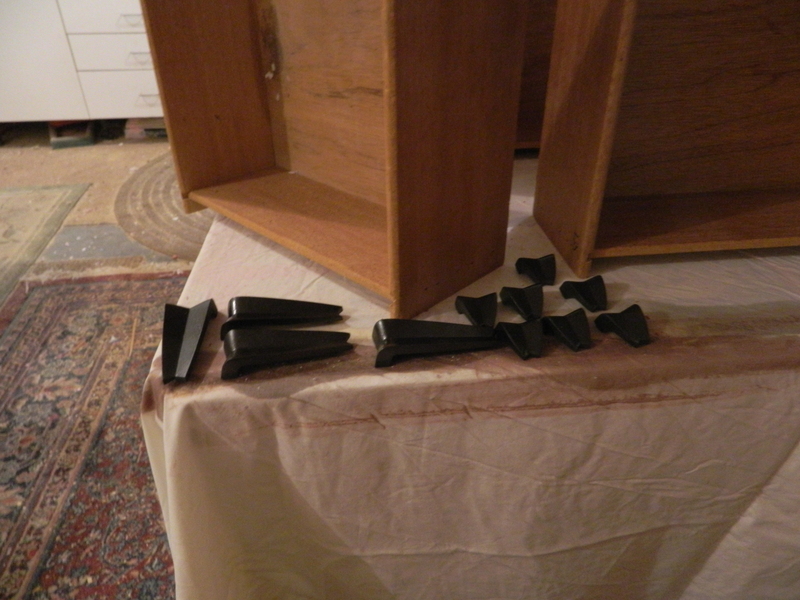 I doubled up on the sides and simply glued the paint sticks to the back. This is where my massive (and wonderful!) collection of clamps come in so handy! 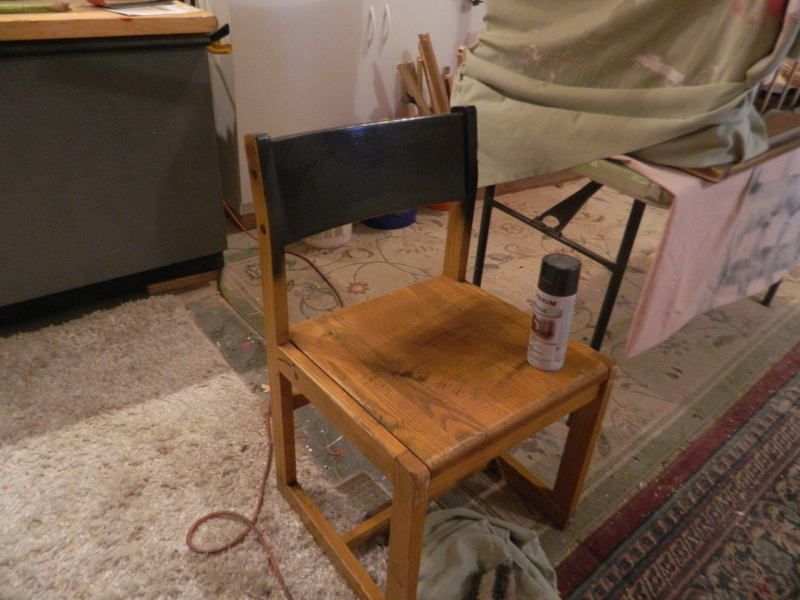 When it was all dried, it required just a little sanding and then I spray painted it black semi-gloss. The whole idea is to showcase all of the baubles, not the case, so black was a good color. I have to admit that originally I intended for the rows to hold 10 bottles, but with the side reinforcements, it narrowed the length just enough to not allow space for that tenth bottle. It works out, though, as having a little room makes it easier to get your fingers on the individual bottle since they’re not so tightly packed in there. It isn’t very deep either, as it is the width of a paint stir stick. And the whole thing is so light, you can pick it up with one hand. I have been toying with the idea of stretching an elastic band across the front of each row so that if bumped, everything doesn’t come tumbling out. I will keep my eyes open for something that might work while I am out perusing the shelves of Michael’s, Joann’s and Hobby Lobby. If you have done a project using paint stir sticks, please let me know! I think I want to showcase about ten projects/ideas and am looking for innovative ways that the sticks have been used. Back to My Red Roots! I have done so much of the pink that I think I am seriously on burn out from it. 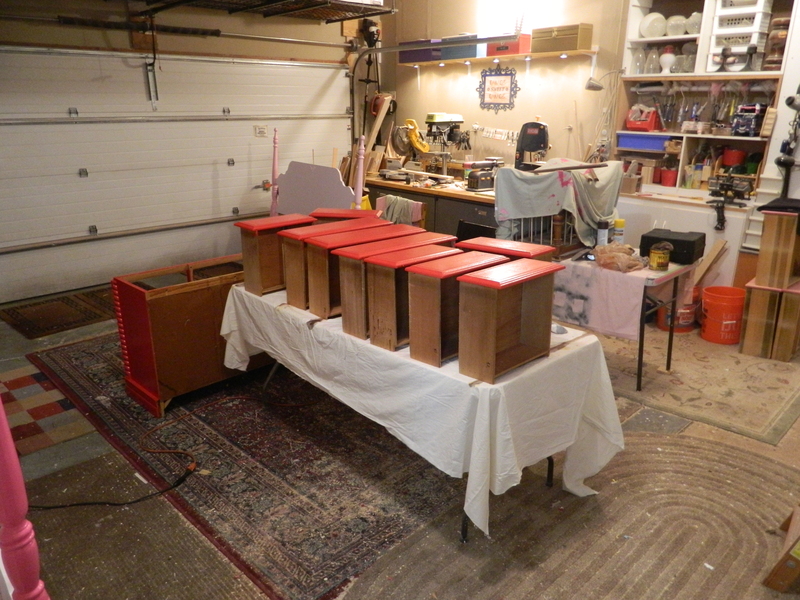 There is pretty much no creative process in it any more, it has become almost an assembly line. Yes, it sells and it sells quickly and for decent pricing, but from a creative standpoint, it isn’t doing it for me! 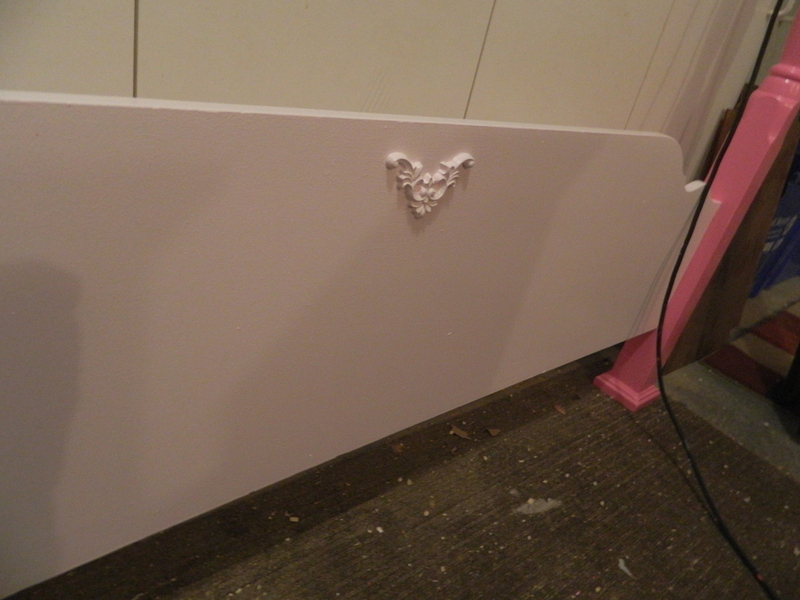 Once I have the head- and foot-boards complete (waiting on some appliques), I think the pink goes on the shelf for a bit. So, I’ve been working on a new line of furniture. I’ve been working on Home Depot’s line of pinks and reds for a while and noticed not so long ago that they’ve changed up the colors. So, of course, I want to use up what I have left and start working with something else. Well, a red caught my eye (and you all know how much I love red) and have set out on the quest of bringing red to the rest of the world. Ha! “No More Drama red”. 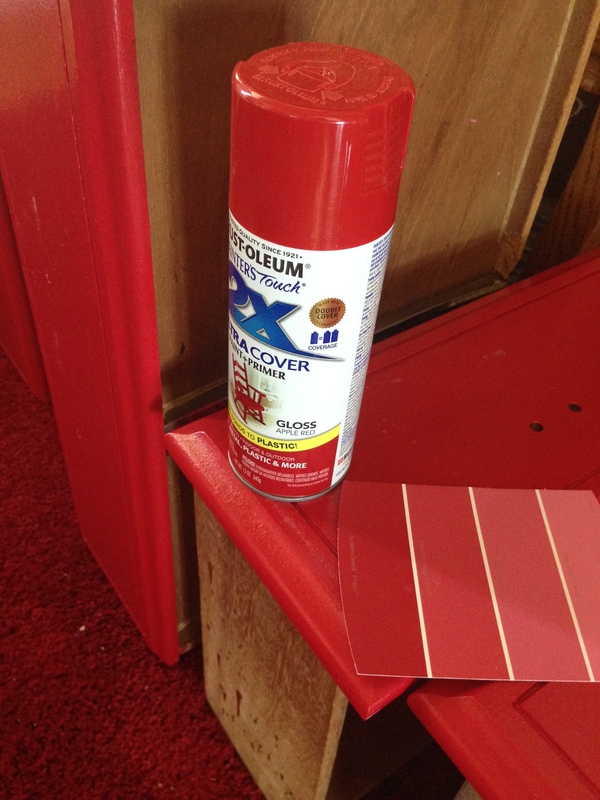 And by wonderful accident, it matches the red that Rust-Oleum has in their double coverage high gloss spray paint! How’s that for a lucky accident? A while back, we picked up some furniture from the warehouse of a religious school and church. I have a 8 foot office door, which is heavy duty wood with the inset glass. 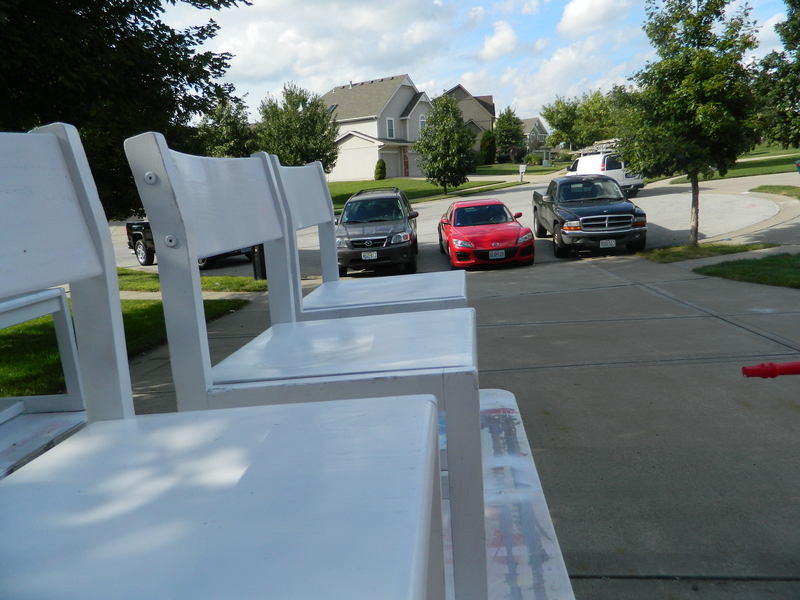 In the same run, we bought a 5′ pew, four wooden school desk chairs and 8 wood seating chairs. I think in all, we paid less than fifty dollars. Of course I forgot to take “before” pictures of the door, but I have already sanding down both sides and filled in the holes from the hinges and door knob. 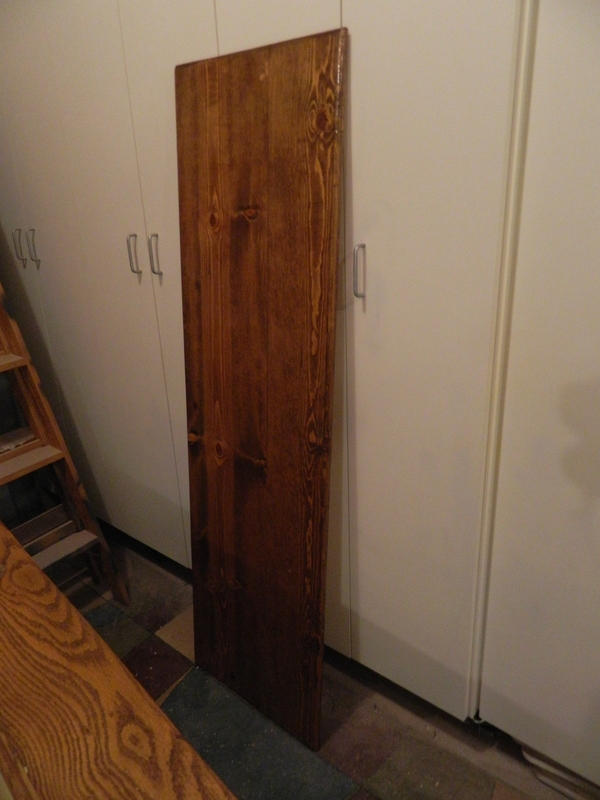 My plan is to re-stain it fairly dark, add a skirt and legs and turn it into a dining table. My guess is that anyone who ever went to a Catholic school might just love it! The legs will be this new wonderful color red that I found. I swear I turned to The Kid and mumbled about replacing our round table with this one. 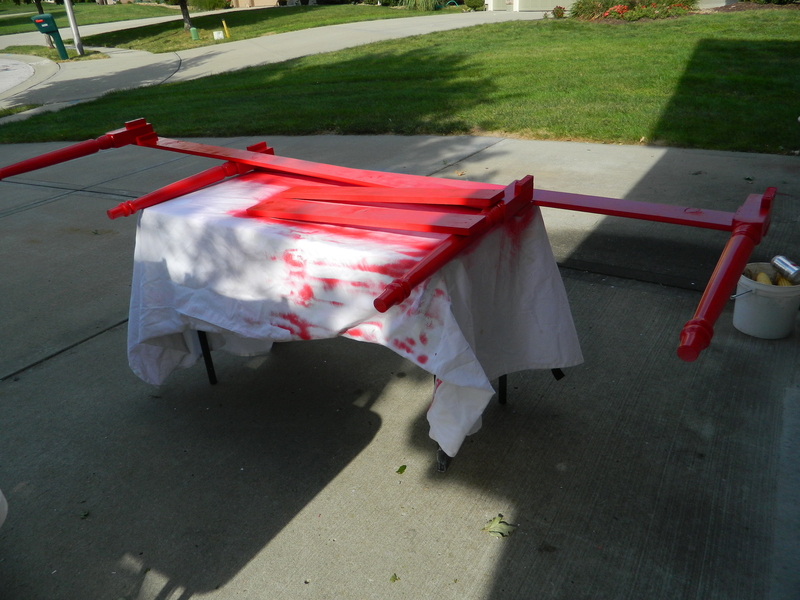 I haven’t even started the paint and staining and I already know that I will love it! The wooden chairs will go with it, could probably seat eight comfortably and I just happen to have eight chairs! They are going to get the red treatment as well. Sanding the door took about four packages of sanding paper and many, many hours and really not looking forward to spending that kind of effort on eight chairs! Maybe the two head chairs will be stained… gotta think about it though. Here are the chairs…. does that take you back to the days of school? My work shop/garage is always packed it seems. We’re not that far from snow and ice weather, so eventually I have to finish some projects or the cars will sit on the driveway. It is so much nicer to not have to scrape off from the windshields and protected somewhat from the cold. 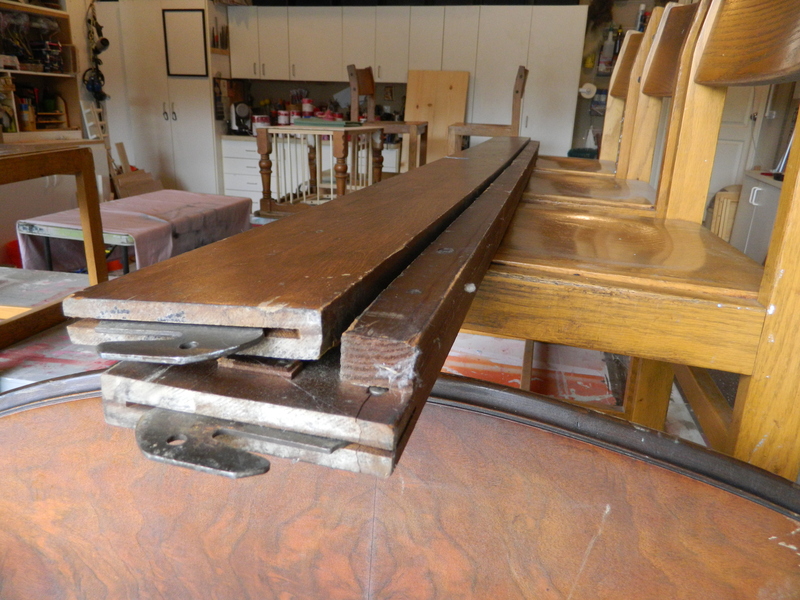 I also picked up a long dresser that would become a sideboard or buffet cabinet. 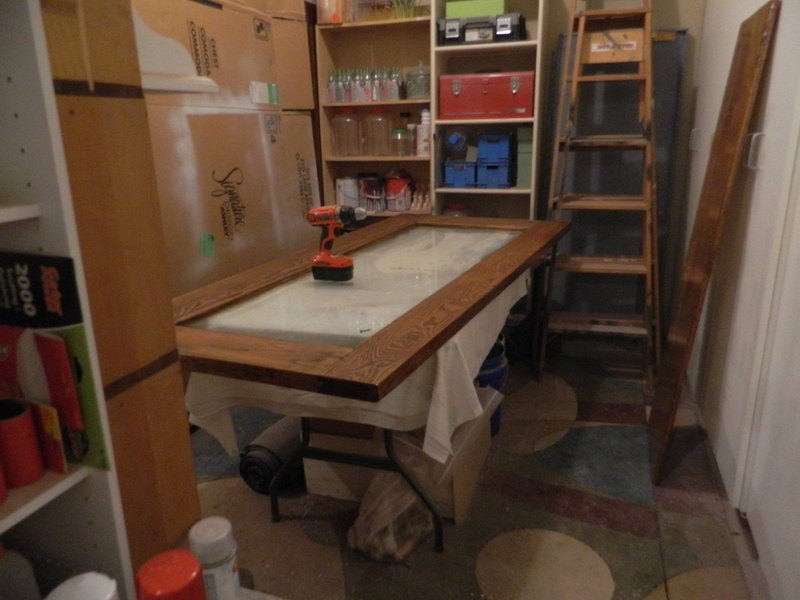 We are replacing the pressed wood top with real wood and it will also get the same stain as the door/table top. 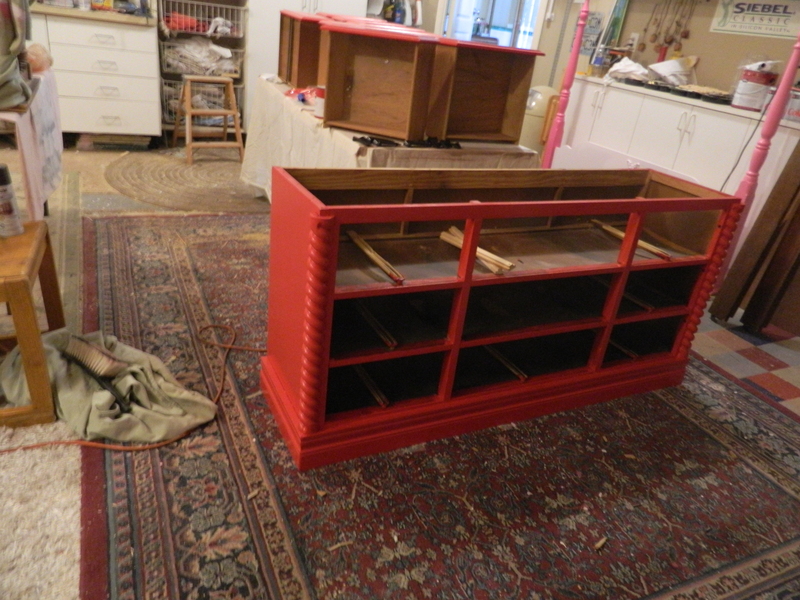 The body and drawer fronts are this new lovely red. 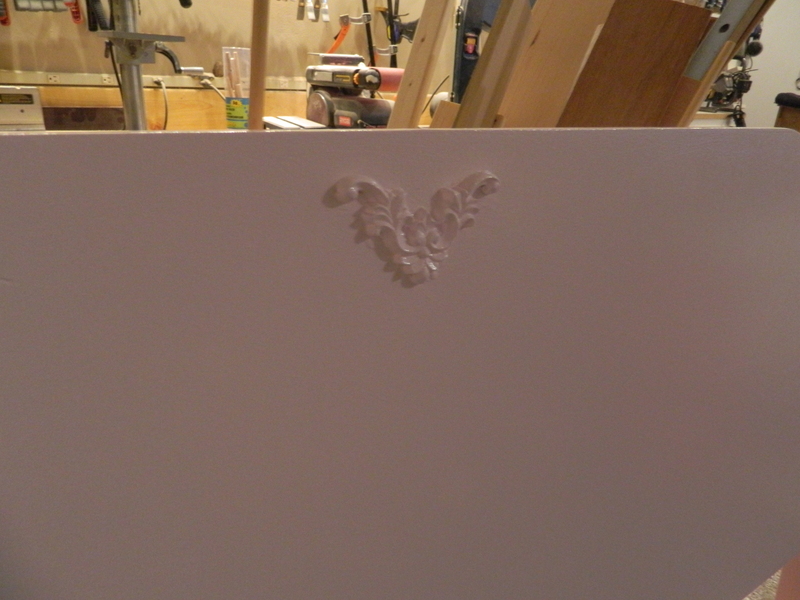 You can see that I have a head start on the drawer fronts. All that red is making me giddy! Disclaimer! 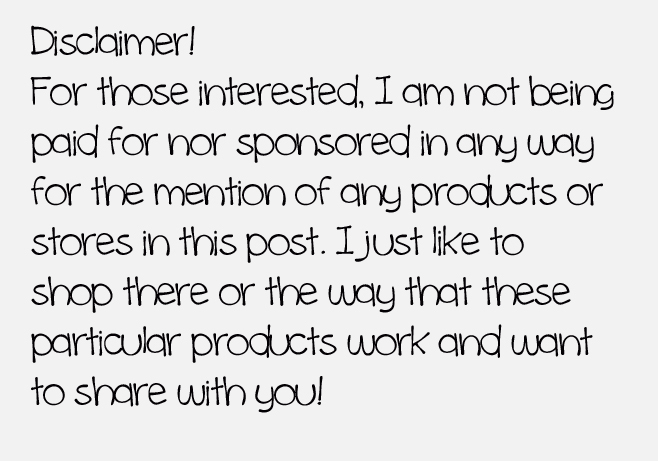 For those interested, I am not being paid for nor sponsored in any way for the mention of any products or stores in this post. I just like the way that these particular products work and want to share.